The Barsetshire novels are perhaps the best loved of all Trollope’s novels. 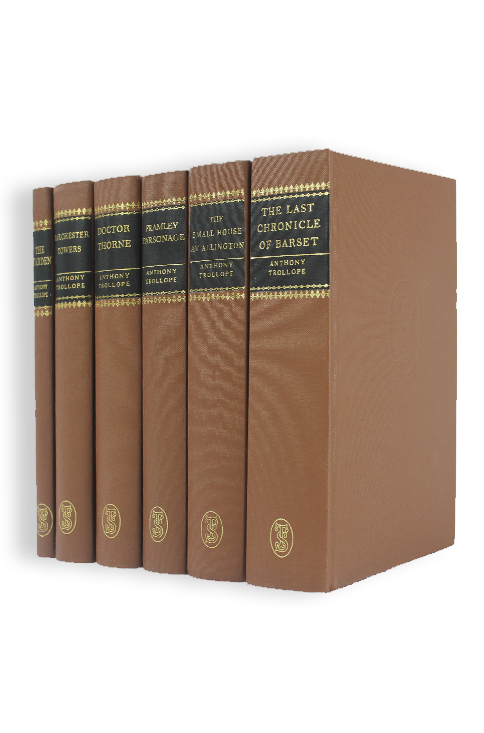 First published between 1855 and 1867, the six novels in the Barsetshire series have remained favourites ever since. The series opens with The Warden, where we are introduced to the cathedral city of Barchester and the surrounding county of Barsetshire. The clergy of Barchester; their ambitions, battles, their loves and their lives are the focus of The Warden and of Barchester Towers, and return to centre stage in The Last Chronicle of Barset. The series also focuses on the clergy of the county, with the young Vicar, Mark Robarts, getting into hot water in Framley Parsonage. In Doctor Thorne we are introduced to the Greshams of Greshamsbury, their financial troubles and loves. Trollope’s most enduring (and as he said in his autobiography, prudish) heroine, Lily Dale looses her heart to the cad Adolphus Crosbie in The Small House at Allington.